An employer-employee relationship built on trust is one of the most important attributes of any successful business. Creating a strong connection and building effective communication with your employees is what businesses strive to achieve. Businesses who are successful in establishing a point-of-contact with their workforce and communicate their company’s policies and procedures in an effective tone are more likely to avoid potential in-house conflicts and misunderstandings. An employee handbook serves as a blueprint that helps employees know what they can expect from the company as a whole. 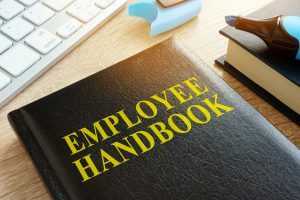 An employee handbook is an important tool that communicates the company’s rules and outlines business’s policies, procedures and expectations of employees. A well-written handbook is absolutely essential for kicking-off an effective communication and creating a robust relationship with your employees. In short, it helps employees know that what the company expects from them is deemed important. On the contrary, an employee handbook helps companies to know that their employees are on the same page. New hires are generally given a copy of an employee handbook on their very first day along with important forms to sign, acknowledging and agreeing to the terms. A well-crafted employee manual highlights the important aspects of the business that are mostly HR concentrated. These help companies to avoid potential conflicts and prevents costly errors and misunderstandings. It is absolutely obligatory for all of your employees (new and old) to have an understanding of your company’s policies and procedures in-depth. They may be hard to comprehend at first glance but it is important that the employee reads them thoroughly. No matter what, employees need to abide by everything stated in the handbook if they want to be considered a responsible employee. An employee handbook shows that the company treats every employee equally and the rules apply to everyone. Whatever company intends to include in the handbook must be well-structured and promote the employees’ interests. This will eventually create a positive culture and safe work environment for each and every individual. Companies can protect themselves from lawsuits, wrongful termination, sexual harassment, gender biases and much more. Drafting an employee handbook is quite an undertaking. Business leaders need to bring attorneys into the loop prior to writing a handbook, which means that you must become familiar with local and federal employment laws. Some businesses have operations in multiple states, which means they need to abide by local and federal policies providing them legal grounds for drafting different handbooks for employees in each state. Why? Because each state has unique employment laws and companies are required to abide by them. The policies that you need to adhere to in an employee handbook by law include medical leave policies (for a serious health condition, childbirth and more), equal employment opportunities, non-discrimination policies, staff’s compensation policies, and more. It is important to understand that the handbook highlights crucial areas of the business that employees need to abide by. Agreeing to the form means that the employee will uphold the company’s rules and policies—it makes no promises on continued employment. This indicates that the handbook is not a contract and this disclaimer must be clearly included in the handbook. The policies of the company are always subject to change. It must be clearly mentioned that policies can change anytime with or without notice, as the company deems appropriate and necessary. An employee acknowledgment page must be included which will let the company know that their employees are aware of the company’s policies, rules, and procedures. What Else Does An Employee Handbook Cover? Depending on the size, nature, and location of the company, you’re required to include the company’s perspective on certain matters. Since the employee manual has to communicate the company’s policies and procedures, it must be productive and communicative enough to make an impact on the employees. An employee handbook must also cover employee policies, employee benefits, bonuses policies, paid time-off policies, company’s history, employee evaluation/disciple/termination policies, office procedures, employee behavior, abiding by SOPs (Standard Operating Procedures) and more. Benefits Of POS Software Who Is Responsible For Cloud Data Protection?